The first round of the super tournament with nine super-GMs and Jon Ludvig Hammer will be held tomorrow in Stavanger. Today the drawing of the lots for the competition was settled by the blitz tournament. Russian GM Sergey Karjakin won the competition with 6.5 points. 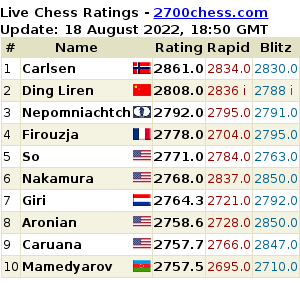 Carlsen, Anand and Nakamura finished with 6 points each. Soon after the tournament was finished Karjakin tweeted: "I got tons of pleasure by playing blitz! Far more boring classic is ahead:))"
According to regulations the winner of the blitz tournament had the right to choose the number in the table by his own. 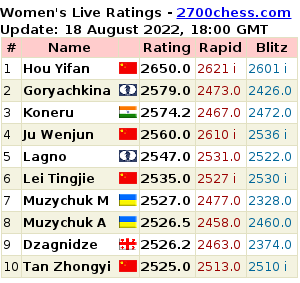 Karjakin chose to be fifth. Sergey Karjakin: "I had no wish of moving into theoretical discussion in Dragon..."
Sergey Karjakin: "I Can't Explain Some of Nakamura's Actions"
In one of the earlier commentaries, when the preliminary composition of the tournament has just been announced, Norwegian Jon Ludvig Hammer noted he would be happy if he'd manage to win at least one game. The friendly match between Vassily Ivanchuk and Anish Giri is taking place in Leon. On the first day the GMs played two games with 45+15 time control, today four games with 20+10 time control took place. Tomorrow Ukrainian and Dutch will play ten blitz games of 5+3. The score counting system is quite unusual: the player gets 2 points for a win and 1 point for the draw or loss. "Now I Am Fully In the Tournament!"